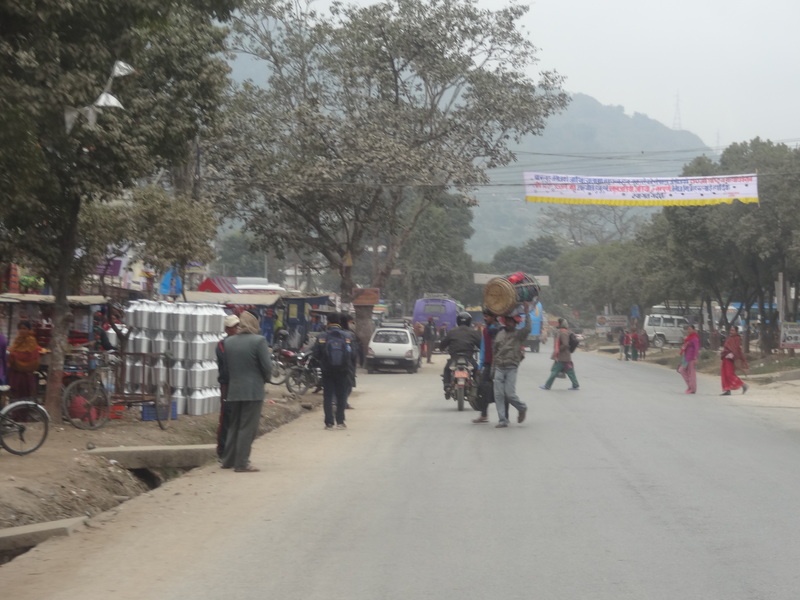 Bandipur is about half an hour climb up from the main Kathmandu-Pokhara highway, about 2/3 of the way along the journey to Pokhara. 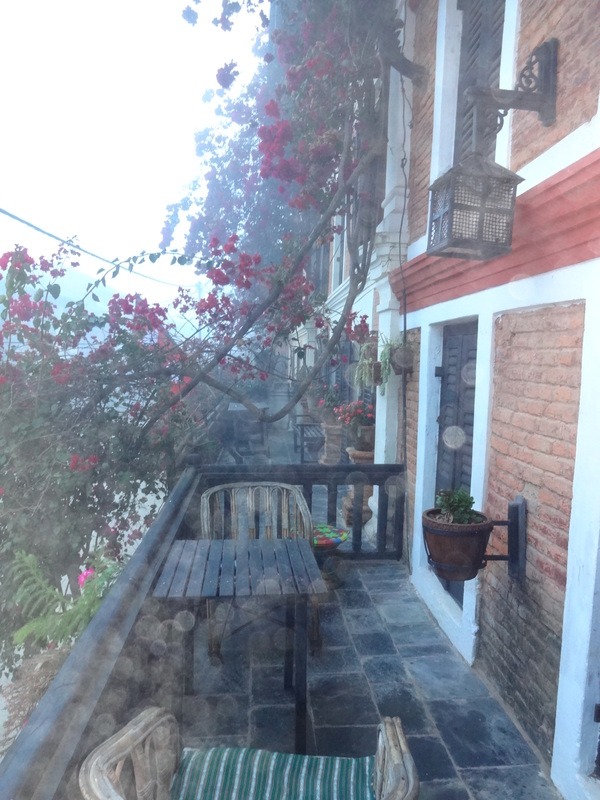 I decided to stop here for our first night as I had heard many good things about the town, and the authentically renovated Old Bandipur Inn is considered the best place to stay in a place that has a lot of accommodation choices. 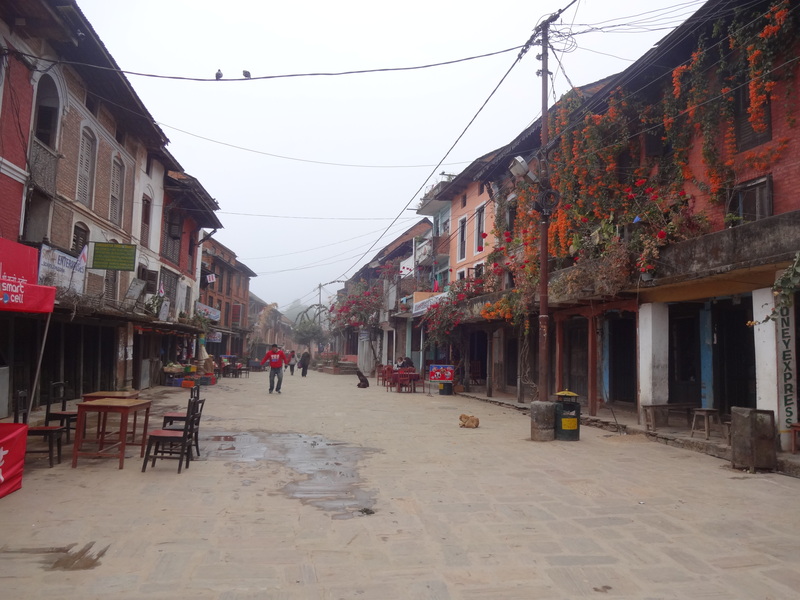 Bandipur is really a one-street town, but its a unique, single street, which is pedestrianized, clean and pretty. Many of the old houses have been restored and it retains a lot of its charm. You can sit and watch locals going about their day without feeling that the authenticity of the town has been handed over to tourism. That’s what makes it unique. 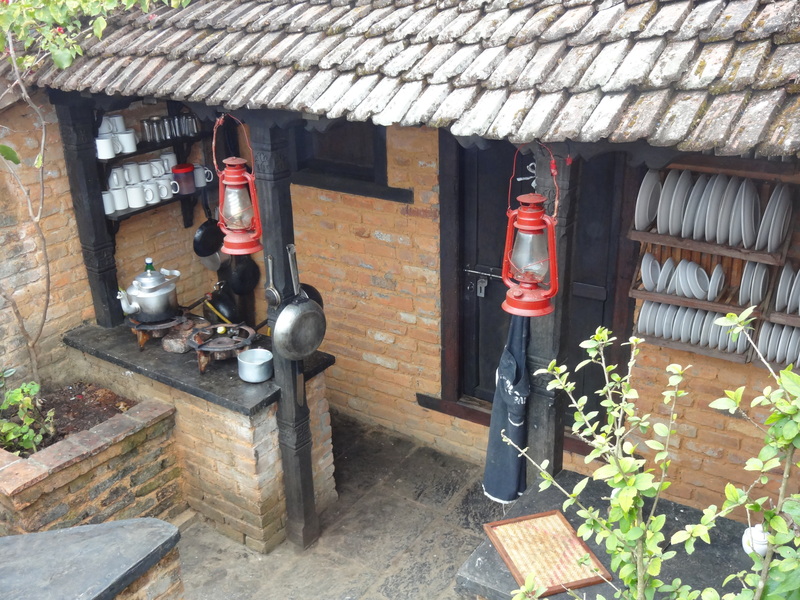 Visiting the Old Bandipur Inn really is like stepping back in time. We arrived around 4pm with the sun low in the sky, about an hour before sunset. Stepping inside the inn with its low doors, low ceilings and small windows, it was already very dark inside. The electricity had been cut so a few lamps burned on the tables and it took a minute for the eyes to adjust to the interior. Inside everything was black and white with simple, traditional wooden furniture. We walked across creaky floorboards up one floor via a very narrow steep staircase to our room. Its narrow double doors were unpadlocked, revealing a room that was almost pitch black. Our hotel guide walked carefully over to the shutters, opening them to allow just enough light to show us around, and pointing out the candle, matches and light switches to us for when the power came back on. We unloaded our things, and took the opportunity to take a look a look around town a little before the sun went down. As I sipped the last of my wine a waiter came to the table with hot water bottles. I pretty much grabbed one out of his hands. 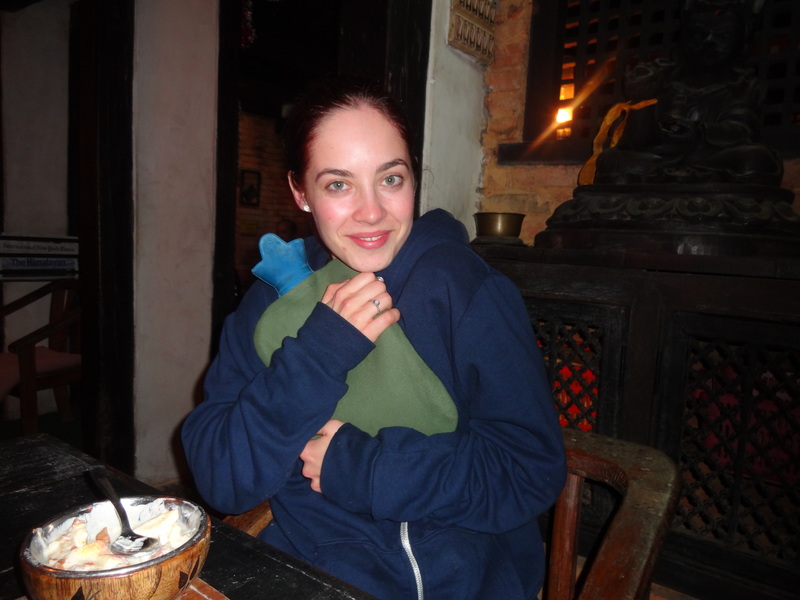 It was such bliss to sit with with the hot water bottles stuffed down our shirts with full bellies. 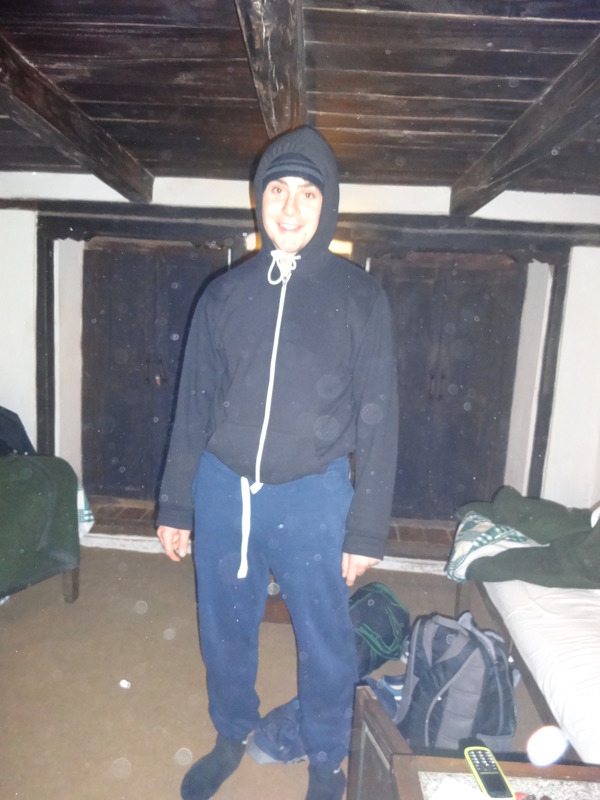 The problem was we had to go to bed and the prospect of the dim unheated room wasn’t very appealing. As the bottles turned from hot to warm, we summoned the courage to go upstairs and try to settle down for the night. Water bottles on a very chilly December night in an unheated inn. Bliss! Fortunately the electricity was back on for a while as we regrouped for bed. Pajamas were out of the question. We slept in sweat pants, hoodies and socks. We layed on blankets and climbed in our beds with the last of the water bottle’s heat, hoods tightened around our heads. We never really got cosy that night, but none of us froze either, and we slept quite well. I awoke first and knew that if we didn’t open the shutters for light, we would end up sleeping way too late. Unfortunately, once you opened the shutters the cold morning air was upon you ….there was no glass. Early morning view once I was brave enough to open the shutters to let in the first light and early morning mist. This photo was taken with the flash…it was still really dim in the room. 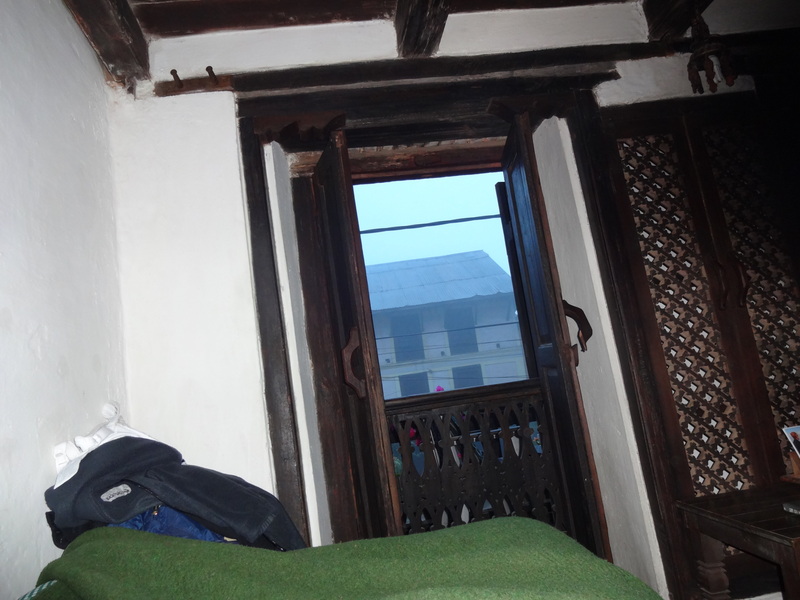 With the wooden shutters open it was suddenly very damp and cold. No glass on the windows! 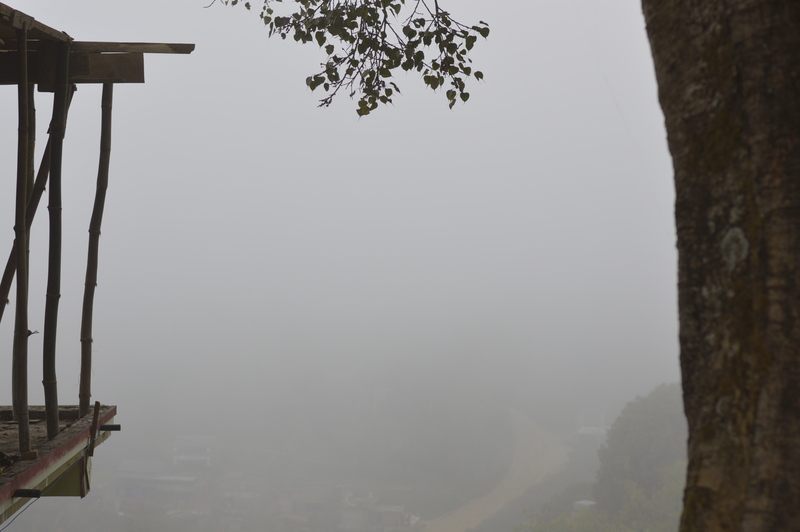 I was exceptionally misty that morning and the hopes of walking to a nearby cave before we left around lunchtime quickly died. Instead we went down to breakfast and took it in turns to face the prospect of showering in a freezing cold room. The shower was surprisingly good and the water was really hot. But it was a real leap of faith to take off your clothes, stand on the freezing old tiles and turn on the water…. Back at breakfast, we waited in the unheated dining area for hot coffee. It seemed very, very cold. We could see our breathe as we sipped our drinks and watch the waiter come and go through the open doors and windows. The line between “inside” and “outside” was truly blurred. In truth it wasn’t really so cold, perhaps somewhere around 8 degrees Celcius/or the early 40s Farenheit, much, much warmer than so many Winter temperatures in other places. But never truly getting warm all day and all night, creates a different sense of cold than experienced if your Winter is spent dashing through bitter weather from heated apartment to heated car. Breakfast was decent oatmeal and eggs. 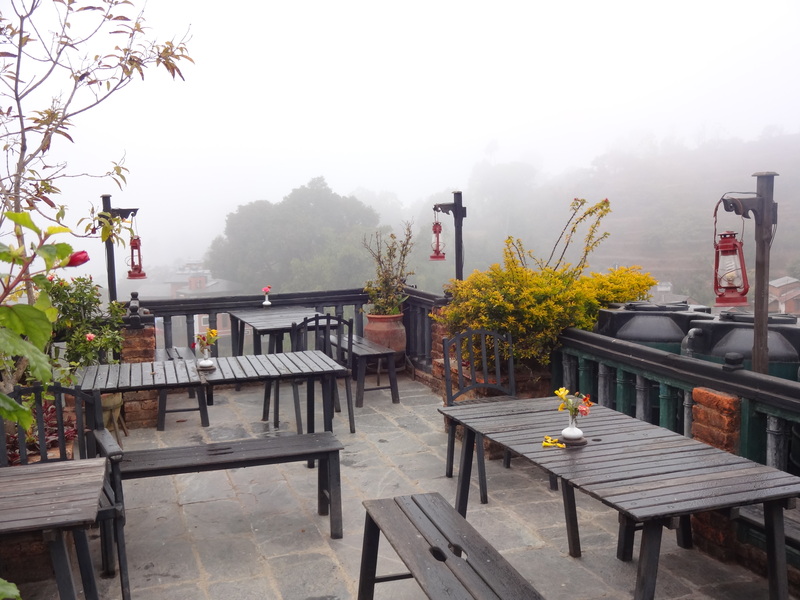 We packed and took a look around the roof garden and some of the hotels nooks and crannies before moving on to Pokhara to meet Robert in the afternoon. 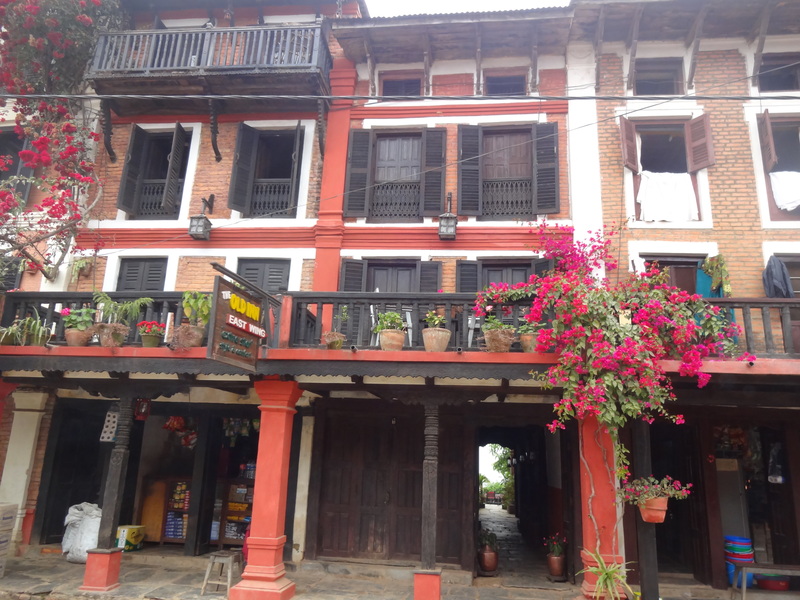 The Old Bandipur Inn is a beautifully restored place with authentic Newari architecture. 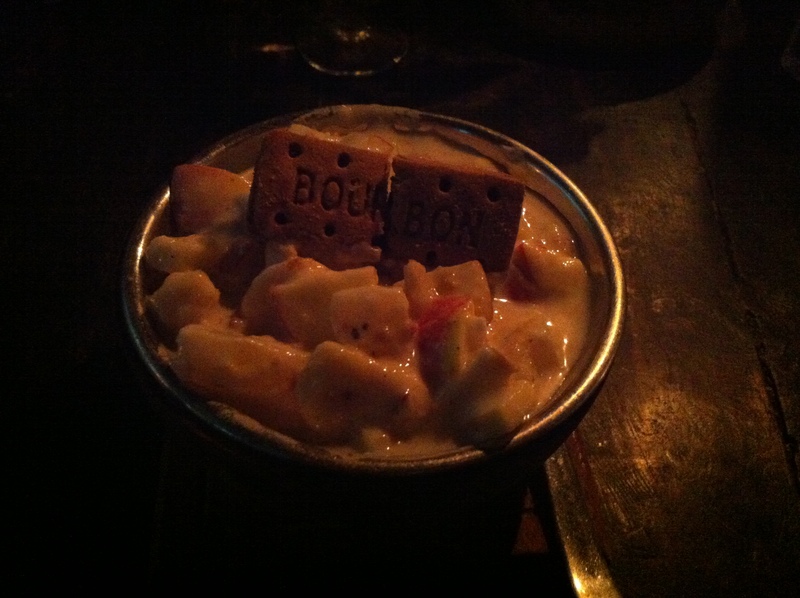 They did a good job with the food and the service was decent. Ironically, if we had visited at a different time of year, our experience may have been more “chilled”, but it turned out to be chilly instead and that governed a great deal of our experience of the place. 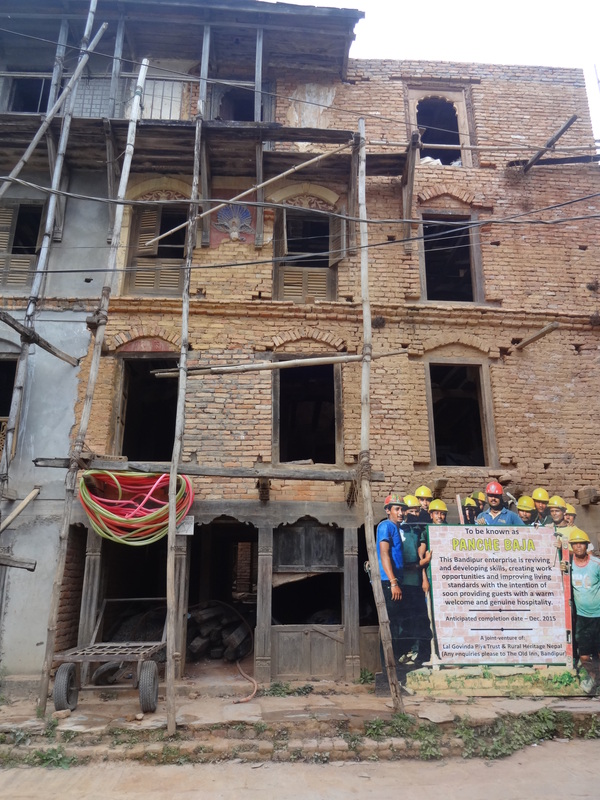 I thought the price was very high for Nepal…especially for an unheated hotel that made no concession for Western expectations of comfort. 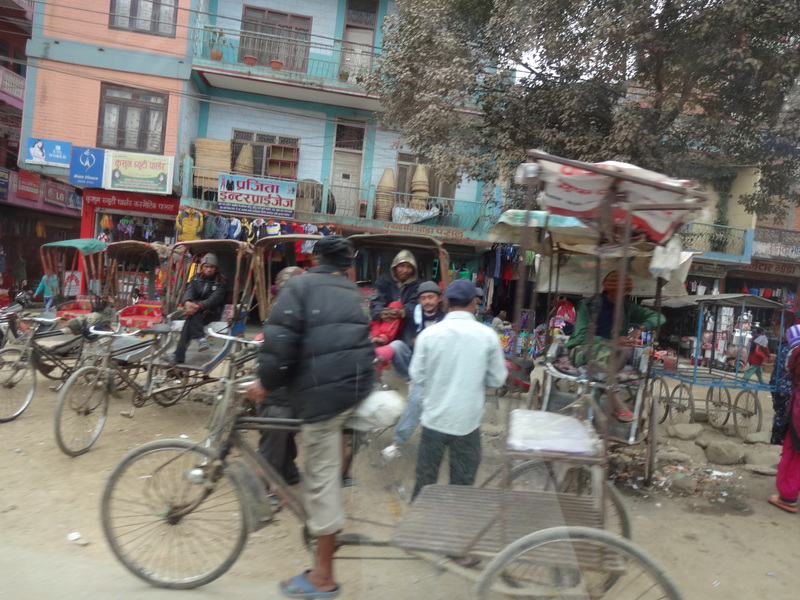 However,I chose to take the lack of heat as part of the authencic experience, and a reminder that most Nepalis live bundled up in unheated homes every Winter. And if I think back to my childhood without central heating, much of our house was pretty cold too…especially our Arctic bathroom! I don’t expect all foreigners to be that forgiving, though, especially at the prices they charged. So be warned that this is the real deal on authenticity. Our driver stayed at another hotel for about 1/10th of the price, and I don’t expect we had anything that he didn’t except hot water and a touch more ambience. 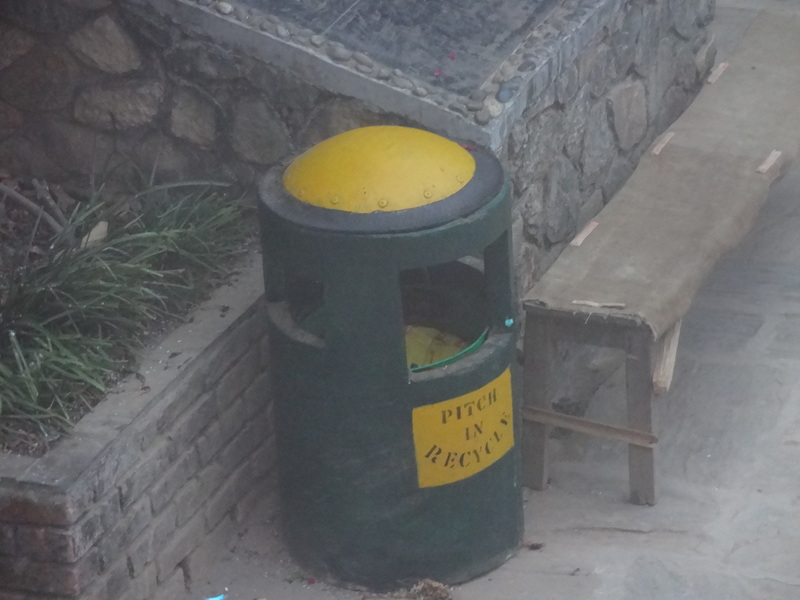 Hot water, of course, is a big deal…how most Nepalis do Winter without hot water, I don’t know. 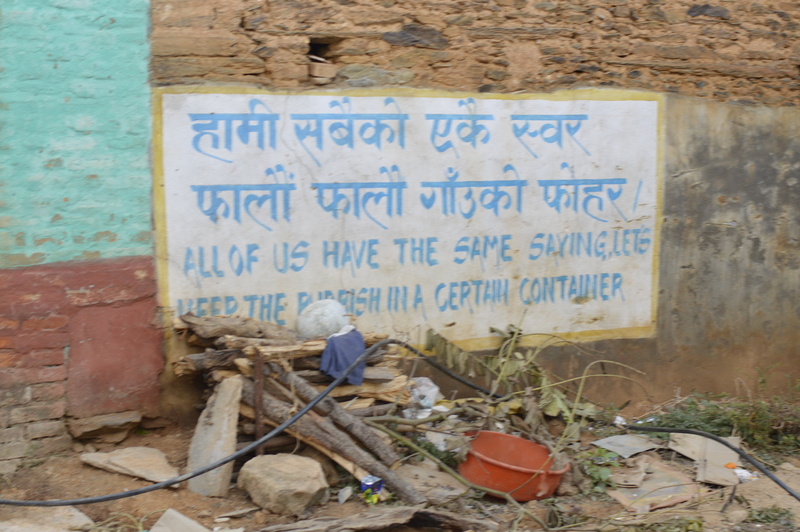 But I appreciate very much that we have it normally… especially after the Old Bandipur Inn’s romantic reminder of my blessings! Our eagerly awaited week-long road trip didn’t get off to the best of starts. 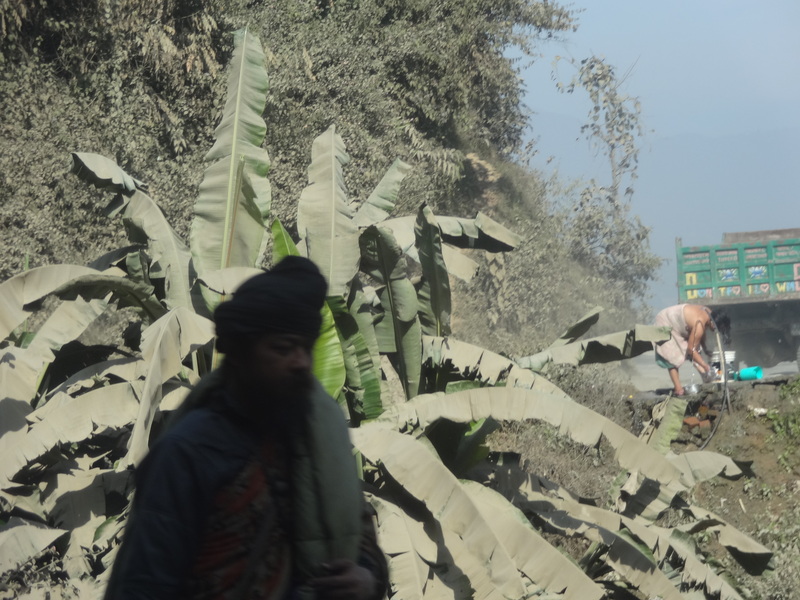 Our driver started the engine as we stood waiting to load the car with suitcases and it made a very disturbing strange noise, and belched black smoke from the exhaust. Three hours, 2 mechanic visits, 30 phone calls, three trips, and one replaced air filter later…we loaded the car and left quite a bit behind schedule. 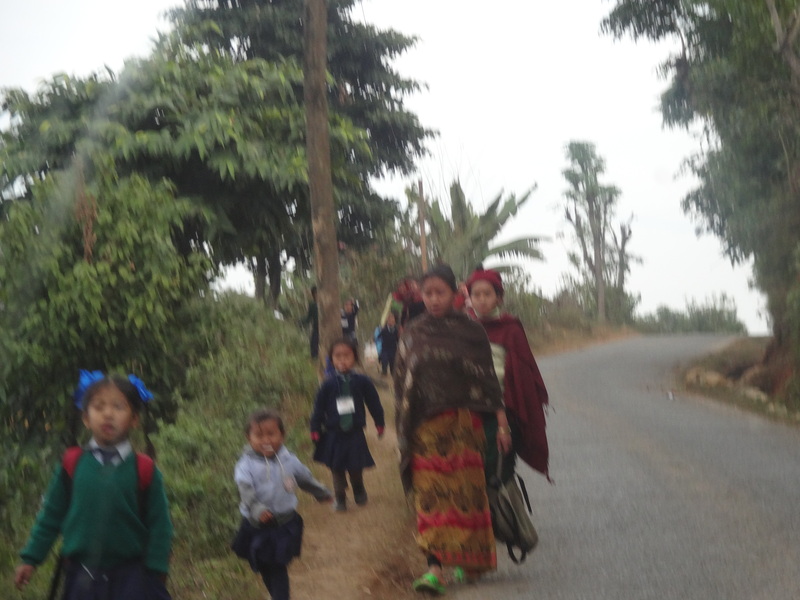 I was grateful that it wasn’t something more serious, but the late departure meant that we hit some traffic on the way out of Kathmandu, but even that wasn’t too bad. And the prospect of driving out of the dusty congestion kept us going as the city disappeared quite quickly turning into a two lane highway up and out of the valley. 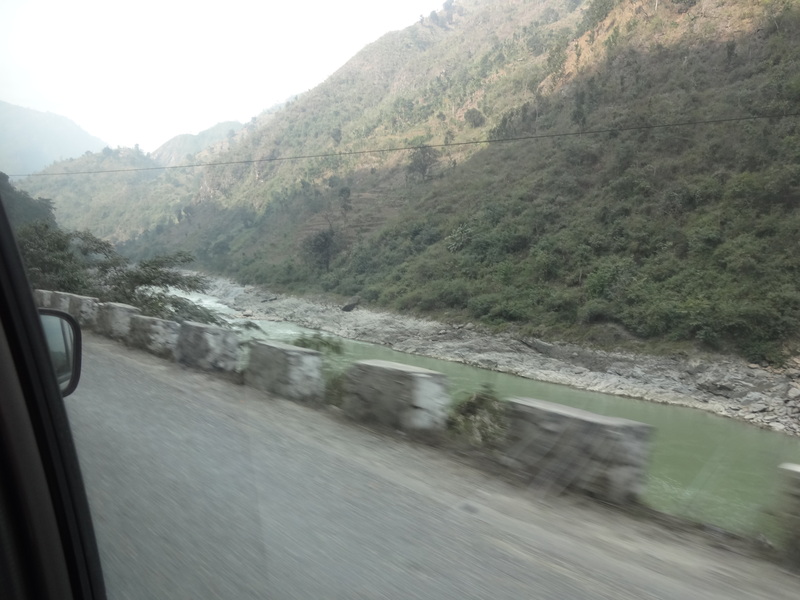 The first part of the road westward out of Kathmandu. 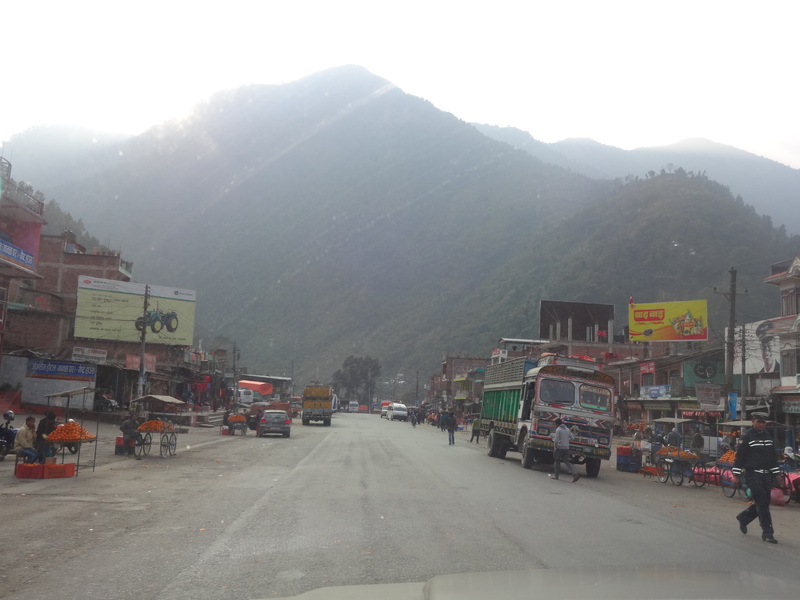 Narrow windy roads with trucks are one thing, but when they are also resurfacing the road as well, its something else. Fortunately it wasn’t too congested and drivers were surprisingly well behaved. And the dust! Its the dry season and the unpaved (or partially paved) roads cause an incredible amount of dust which coats the roadside plants so heavily that they are almost unrecognizable. I managed to snap this banana plant with one new, still freshly-green leaf. Poor thing…it won’t be green long. I enjoyed our drive. 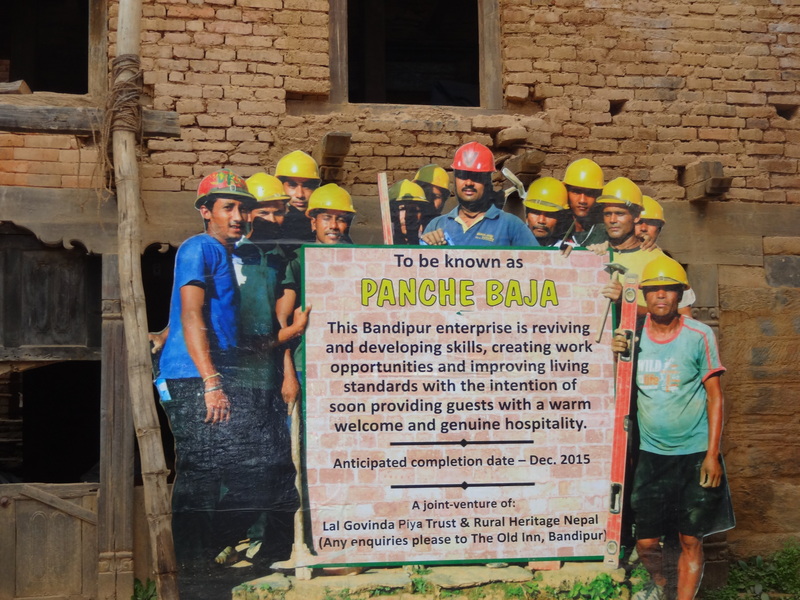 Nepal is so much more than Kathmandu’s chaos and trekking. 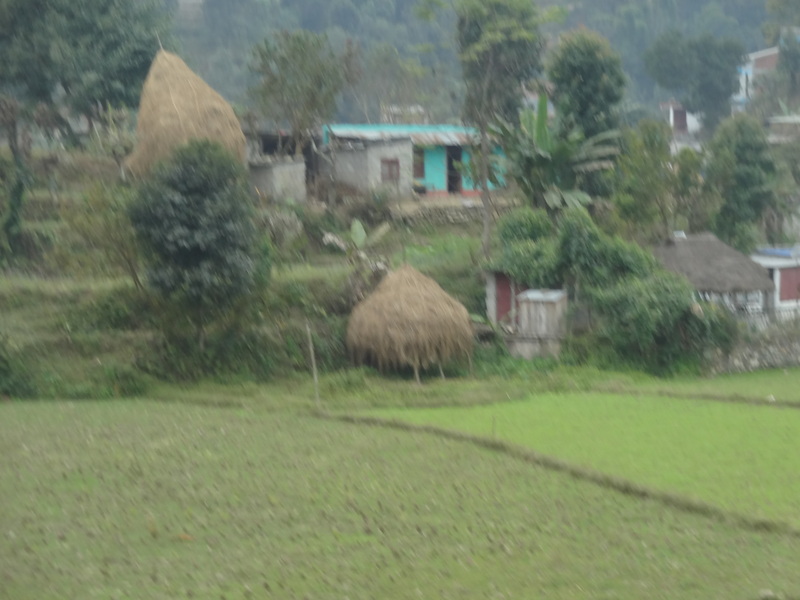 It was my first real chance to see villages without garbage, small town life, farms and farming towns, and the Trisuli river which ran with us on much of the journey. 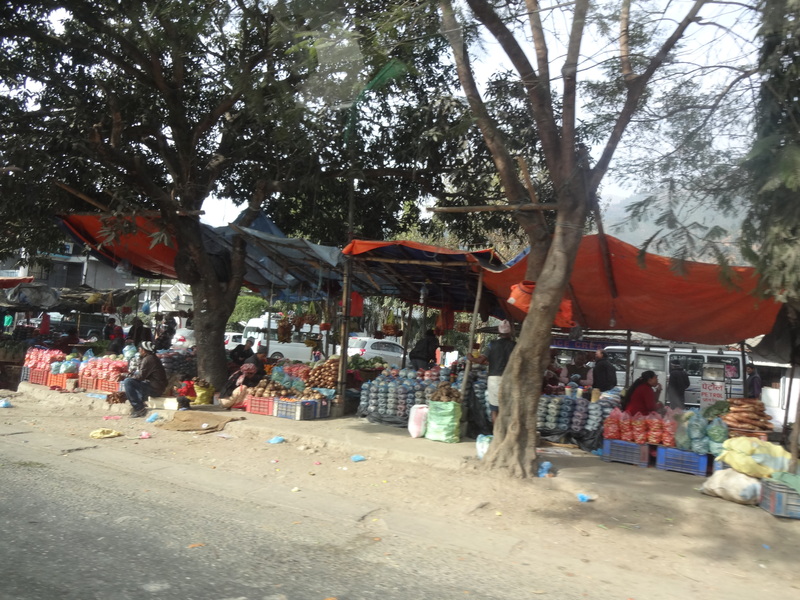 The scenery was interesting and varied and the towns ranged from pretty and agriculturally charming to dusty, dirty transportation hubs. I tried to capture a little of each as we flashed through it all on the 4-5 hour drive to Bandipur – our first stop for the night. 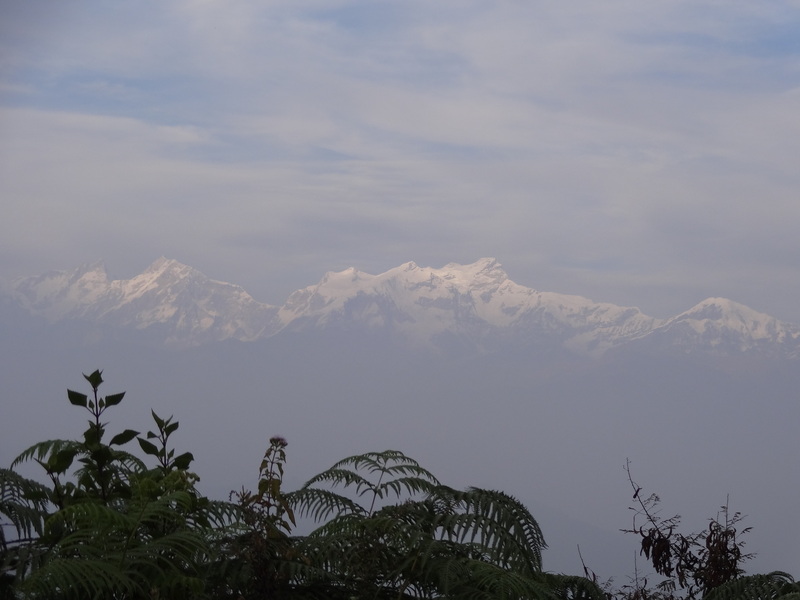 First glimpse of the Annapurnas as we climbed the 7km mountain road up to Bandipur.